This as a series of photos showing our 5th wheel RV that we are selling. It is a Model Year 2000 37’ Fifth Wheel RV with Triple Slide-outs. 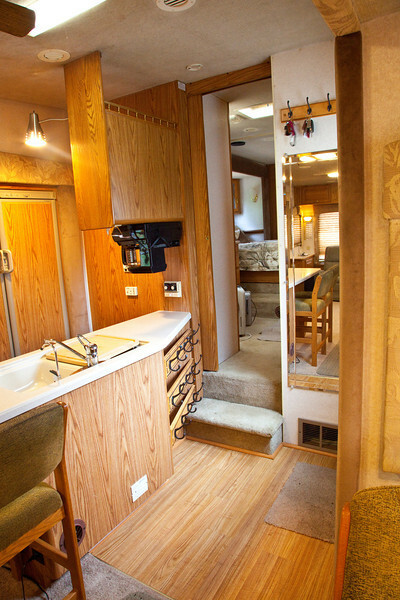 This is a very spacious 5th wheel that would serve as a fully furnished, ready to live-in apartment. It has many extras and upgrades including an electric fireplace and a surround sound media center. There are flat screen TV’s with DVD players in the living room and in the bedroom. There is lots of storage and lighting. Porcelain sinks in the kitchen and porcelain toilet in the bathroom. Solid oak cabinet faces give it a great aesthetic feeling. National RV Sea Breeze 5th wheel. View of main entry showing kitchen island, coffee maker, composite counters, full length mirror, forced air furnace intake, coat racks, shoe racks, entry to bedroom and bathroom area.